Occurrence: Squid are normally eaten cooked. Consumption varies greatly between regions with high consumption in Spain (as calamari) and in Japan. Allergy to molluscs such as squid is less common than allergy to shrimps (crustaceans). Although squid has no shell it is related to shellfish such as clams and mussels. As with most food allergies, symptoms are usually mild such as oral allergy syndrome but severe symptoms such as anaphylactic shock can also occur after consumption. Note that squid are not currently listed in annex IIIa of the EU directive on labelling of foods and thus individuals allergic to squid must be alert to the possibility of squid or other molluscs as hidden allergens. Squid are a type of mollusc called a cephalopod and thus allergy to squid is associated with allergy to other cephalopods such as cuttlefish or octopus. Reaction is also likely after ingestion of more distantly related shellfish (molluscs) such as limpet, snails, winkles and whelks or clams, mussels, oysters and scallops. Thus after a diagnosis of allergy to one mollusc, patients are normally advised to avoid all molluscs. Whilst most individuals with allergy to shrimps (crustacea) can tolerate molluscs, individuals with allergy to both types of shellfish have been reported. However, individuals allergic to finfish (such as cod or salmon) do not generally have allergies to shellfish. Other Information: The squid image (Loligo spp.) is from "A Photographic Visit to Ocean Park, Hong Kong" by Howard Norfolk (http://www.aquarticles.com). Petrus et al. (1999)  report a case of a 5 year old boy who suffered Quincke oedema after eating squid. Carrillo et al. (1992)  reported seven patients who reacted after ingesting squid or inhaling vapors from cooking squid. Castillo et al. (1994)  extended this series to 24 and Castillo et al. (1996)  to 33 patients. Symptoms included urticaria/angioedema, asthma, rhinitis, gasterointestinal and anaphylactic reactions. Miyake et al. (1987)  and Miyake et al. (1988)  report a case of exercise-induced anaphylaxis after eating both shrimp and squid. The 13 year old boy was sensitized to shirmp, squid, crab, octopus, clam and short-neck clam. Carrillo et al. (1992) , Castillo et al. (1994)  and Castillo et al. (1996)  used PBS extracts of raw and cooked squid, octopus and limpet which were centrifuged and passed through 0.22 µm pore filters (Millipore) together with commercial extracts of aeroallergens (cockroach), shrimp, lobster, crab, mussel and clam. Protocol: (controls, definition of positive etc)Carrillo et al. (1992) , Castillo et al. (1994)  and Castillo et al. (1996)  attributed a positive raction when wheals ≥3 mm developed after 15-20 minutes. Carrillo et al. (1992)  tested 7 patients, Castillo et al. (1994)  tested 35 shellfish allergic patients and Castillo et al. (1996)  tested 107 patients. Miyake et al. (1988)  tested one patient. Castillo et al. (1994)  reported that there was no significant difference between raw and boiled squid or octapus. 73.7% of squid positive patients also reacted to cockroach. There was a strong association of SPT positives between shrimp, squid, lobster and crab (18 patients). There was also a significant association for positive reactions to squid, octapus, mussel and clam. Carrillo et al. (1992)  reported that all 7 patients gave strongly positive SPTs to squid and crustaceans (shrimp, lobster and crab). Miyake et al. (1988)  found positive SPTs with shrimp, squid, crab, octopus, clam and short-neck clam. Miyazawa et al. (1996)  used 100 g fresh squid, cut into small pieces with scissors and boiled in distilled water (300 ml) at 100° C for 10 minutes, then centrifuged at 20,000 x g for 20 minutes. Carrillo et al. (1992) , Castillo et al. (1994)  and Castillo et al. (1996)  used PBS extracts of raw and cooked squid which were centrifuged and passed through 0.22 µm pore filters (Millipore). Miyazawa et al. (1996)  used CAP and immunoblotting. Carrillo et al. (1992) , Castillo et al. (1994)  and Castillo et al. (1996)  used CAP or RAST. Number of Patients:Miyazawa et al. (1996)  used sera from 4 squid allergic patients and 7 shrimp allergic patients. Petrus et al. (1999)  reported RAST class 4 for dust mite, class 3 for squid, shrimp and Cocksfoot grass pollen. Carrillo et al. (1992)  report that all 7 patients were RAST positive for squid and for crustacea. IgE cross-reactivity between squid and shrimp and other crustaceans was demonstrated by reverse immunoassay inhibition studies. 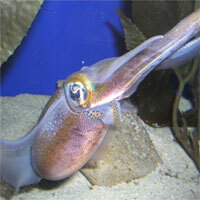 Cross-reactivity could not be demonstrated between squid and octopus nor between squid and other mollusks. Castillo et al. (1994)  report a poor correlation between SPT and RAST results for squid, shrimp and clam. Immunoblotting separation:Miyazawa et al. (1996)  separated proteins using 1-D 5% to 15% gradient SDS-PAGE gels under reducing conditions. Immunoblotting detection method:Miyazawa et al. (1996)  transferred the proteins to a polyvinylidene difluoride membrane (Bio-Rad Laboratories). The membrane was rinsed in PBS, and blocked with 1% (w/v) bovine serum albumin (BSA) in PBS. After another rinse with PBS containing 0.02% (v/v) Tween-20, it was cut into strips, which were incubated overnight with the patients’ pooled serum diluted 1:2 (v/v). After being washed, the strip was incubated with anti-human IgE antibody–conjugated alkaline phosphatase (Quidel, San Diego, Calif.) overnight, and stained with 5-bromo-4-chloro-3-indolyl phosphate/nitroblue tetrazolium. Immunoblotting results:Miyazawa et al. (1996)  reported that the abundant 38 kDa protein from extracts of boiled squid bound IgE from squid allergic patients. There was cross-reactivity between the squid 38 kDa protein and shrimp tropomyosin using IgE or a murine monoclonal antibody. Food used and oral provocation vehicle:No reported. Blind:Petrus et al. (1999)  used open labial challenge. Number of Patients:Petrus et al. (1999)  challenged 1 child. Symptoms:Petrus et al. (1999)  report a strongly positive labial challenge with labial oedema, swelling and intense itching. Castillo et al. (1994)  suggest that there was IgE cross-reactivity between squid and cockroach; shrimp, squid, lobster and crab (also shown by Miyazawa et al. 1996 ); and squid, octapus, mussel and clam. Castillo et al. (1996)  suggest that the squid - cockroach link might be due to a common allergen with house dust mites. Petrus et al. (1999)  also shows a link to house dust mites. The Pharmacia squid allergen f58 is from Todarodes pacificus and f258 is from Loligo spp. Tabka et al. (1998)  and Goday Bujan et al. (1991)  report cases of occupational allergy to squid. Tabka et al. (1998)  cases included an individual with food allergy to shrimp. Carrillo T, Castillo R, Caminero J, Cuevas M, Rodriguez JC, Acosta O, Rodriguez de Castro F.
Squid hypersensitivity: a clinical and immunologic study. Petrus M, Nyunga M, Causse E, Chung E, Cossarizza G.
Miyake T, Kawamori J, Yoshida T.
Castillo R, Delgado J, Quiralte J, Blanco C, Carrillo T.
Food hypersensitivity among adult patients: epidemiological and clinical aspects. Jeoung BJ, Reese G, Hauck P, Oliver JB, Daul CB, Lehrer SB. Quantification of the major brown shrimp allergen Pen a 1 (tropomyosin) by a monoclonal antibody-based sandwich ELISA. Goday Bujan J, Aguirre A, Gil Ibarra N.
Allergic contact dermatitis from squid (Loligo opalescens). Only five peptide sequences available. Process, chemical, enzymatic:Allergenicity can survive cooking, possibly because tropomyosin have a very simple helical structure which can rapidly refold after denaturation. Nature of main cross-reacting proteins:Miyazawa et al. (1996)  demonstrated that shrimp tropomyosin completely inhibits IgE binding to squid tropomyosin. Carrillo et al. (1992) , Castillo et al. (1994)  and Castillo et al. (1996)  show that almost all squid allergics in their study were allergic to shrimp. Miyazawa et al. (1996)  used 100 g fresh squid, cut into small pieces with scissors and boiled in distilled water (300 ml) at 100° C for 10 minutes, then centrifuged at 20,000 g for 20 minutes. The supernatant was used as the crude extract. Ammonium sulfate was added with stirring to 50% saturation. After centrifugation at 20,000 g for 20 minutes, the resulting precipitate was collected and dissolved in 0.05 mol/L Tris-HCl buffer, pH 8.0, and then dialyzed against the same buffer. The sample was applied to a DEAE-Sepharose column (Pharmacia). Fractions were collected with a linear gradient of 0.18 to 0.6 M NaCl in Tris buffer and those with allergenic activity were pooled and dialyzed overnight in 0.01 M phosphate buffer (pH 6.8). This was applied to a hydroxylaptite column (Bio-Rad Laboratories, Hercules, Calif.). Fractions were collected with a 0.01 to 0.5 M NaCl gradient in the same buffer, and those with allergenic activity were pooled and dialyzed against phosphate-buffered saline. This was applied to a Sephacryl S-300 column (Pharmacia) equilibrated with PBS and the purification of the 38 kDa protein Tod p 1 was verified by SDS-PAGE and immunoblotting. These differ from the sequence http://www.expasy.org/uniprot/Q6E216 which is only distantly related to allergenic tropomyosins.